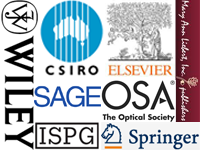 • Trial access to all 23 journals of the Australian governmental research organization Commonwealth Scientific and Industrial Research Organisation (CSIRO). • Lib4RI users have access to all Elsevier journal archives from 2017 on. The archives comprise more than 1,500 journal titles from all subject areas. The oldest titles are available from the 19th century on. in the last few years due to the massive price increases. • We have agreed on a year-long trial for the journals from the publisher Mary Ann Liebert from the subject collections: «Biomedical Research / Life Science Collection» (47 journals), «Technology and Engineering Collection» (4 journals) and «Environmental Studies» (4 journals). • From the Optical Society of America (OSA) Lib4RI now offers an upgraded collection, the «Optics InfoBase». This collection contains 5 additional journals (e.g. Applied Spectroscopy) and the Topical Meetings Proceedings. • After we had reduced the number of SAGE journals for 2016 to only three, we are happy to announce that we have a subscription to a SAGE journal collection again for 2017, the «Urban Studies & Planning Collection», comprising 28 journals. • Thanks to the new Springer database model, Lib4RI can offer access to additional 656 Springer journals. • We have expanded our Wiley backfile collection by 20 journals. These are mainly from the subject area chemistry. Should you encounter access problems or have any questions about our e-journals, we would be pleased to assist you. We also highly value your feedback on our new products. Please contact us at eresources@lib4ri.ch.